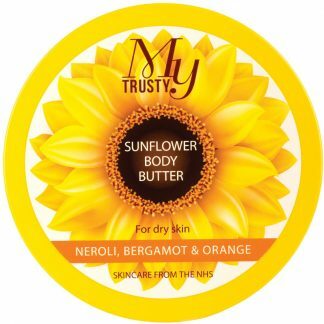 NHS Skincare, My Trusty, Sunflower Face & Body Oil (50 ml) is a light, non-greasy, highly absorbent face & body moisturiser, infused with the natural fragrance of essential oils neroli, bergamot and rosemary, to improve the quality and leave skin, feeling smooth and silky. 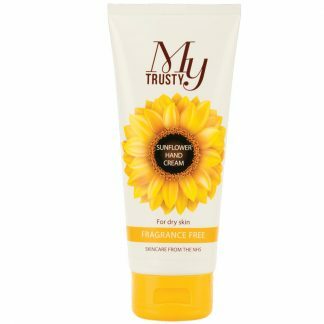 With naturally active sunflower oil to help improve the appearance of blemished skin, i.e. scar tissue or stretch marks. Rich in essential skin improving vitamins E, F and K, renowned for their ability to soothe and protect skin. Suitable for people who may be prone to eczema and other similar dry itchy skin symptoms. Clinically proven to soften skin for up to 24hrs. ‘Freefrom’ lanolin, parabens, SLS & dermatologically tested. Suitable for all ages including people who may be prone to eczema and other similar dry itchy skin symptoms. I have been using your products for some time now, and can’t praise them highly enough, especially the sunflower face oil. I am 65 years old, with sensitive skin and have suffered from rosacea for years, trying various creams and potions (some of them far from cheap) over this time. This winter, despite some really cold temperatures my skin has been greatly improved and to say that I am impressed is something of an understatement. So thank you very much indeed. Gorgeous non greasy nourishing oil. I have dry itchy skin due to an under active thyroid and this oil is heavenly. I just wish I could bathe in it! Smells divine. Love the fact that it’s 99% Natural too. I often recommend this to my Physiotherapy clients with dry or itchy skin conditions. Doesn’t leave any greasy residue – just soaks in beautifully. Love this product! Really nice oil for morning and night and smells amazing! The face oil is wonderful for my sensitive and dry skin . It absorbs quickly leaving my face smooth, soft and calm all day long. Highly recommended. Absolutely love the oil and moisturiser! Having psoriasis, this is so good to soothe my really dry skin and it is the only moisturiser that soaks quickly into my skin – so no fear of my hands slipping off my walking sticks. Also my legs get so dry and scaly they look like moons surface, but applying the oil after bathing, makes them look like different legs. My daughter buys it for me now for Christmas because, as she kindly puts it “mother you have awkward skin and it’s only thing I know you will use and not give away”. I even got my hubby using it on his hands, face and neck as he has no melanin to protect his skin. I bought this after reading Sali Hughes’ glowing review in The Guardian, and she was spot on. It’s very rich but not greasy and absorbs very quickly, and leaves my very dry skin still feeling moisturised at the end of the day. My dry, curly hair also loves it. Even smells divine! Fabulous to use. Skin feels really hydrated and smells lovely. I love this oil! No greasy residue, beautiful fragrance, great moisturiser – I use it on my hair too, great to moisturise the ends and prevents frizz. The only thing I would love changed is the cap colour. Make it yellow, I keep losing the clear one! Love,love, love this delicious smelling oil which sinks into your skin and leaves it so beautifully soft. I have ditched my usual daily moisturiser in favour of this,just don’t get it on your eyes as it can leave you feeling a bit bleary eyed. It really is the most fabulous skin care product out there. I Love how the oil is so easily abosrbed into my skin, non greasy, and skin feels amazing! The face and body oil in particular was excellent, it left my skin moisturised soft and calm. I have very sensitive skin and have always been very cautious about using moisturisers. I have used all of the products My Trusty have produced, including the face and body oil. This new product is truly amazing. It is easily applied and makes my skin feel like silk. It’s re hydrates instantly and has a beautiful aroma. I can’t begin to tell everyone how wonderful the face and body oil is. It’s value for money and I would recommend it to anyone that wants to try a really wonderful product. As I have aged I have noticed my eczema-prone skin becoming drier and flaky in places. I have tried various products including those recommended by my pharmacist but none have helped my skin as much as My Trusty. I regularly use the body butter and the face oil and they have made a huge difference to the appearance and feel of my skin and my eczema has disappeared. As you know psoriasis is a very difficult problem and there is no cure but I find your oil excellent. I love all your range, especially the face and body oil which is amazing and makes my skin feel so silky. I use it instead of a daily face moisturiser. The body butter is great for dry feet too. WOW!! The face and body oil is absolutely fantastic. I have rosacea and psoriasis on my face and nothing seemed to be working to keep it at bay. Not any more, the oil has moisturised my skin & left it feeling silky. 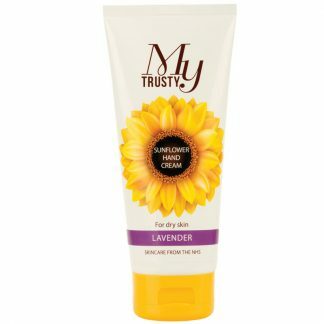 Itchy skin on my hands/arms & legs are also a thing of the past, the body butter and sunflower cream has seen to that. All in all, I have to give it 10/10 for the following reasons: Cost effectiveness, natural ingredients, no parabens & not tested on animals. What more can you ask for. Fantastic. I have tried so many different creams but nothing compares to these. I have completely fallen in love with My Trusty Face & Body Oil. This is gorgeous to use and soaks in really well. From the first use my skin is feeling smooth and soft and leaves it moisturised all day. A gorgeous product from a wonderful range of other gorgeous goodies. Keep up the great work!